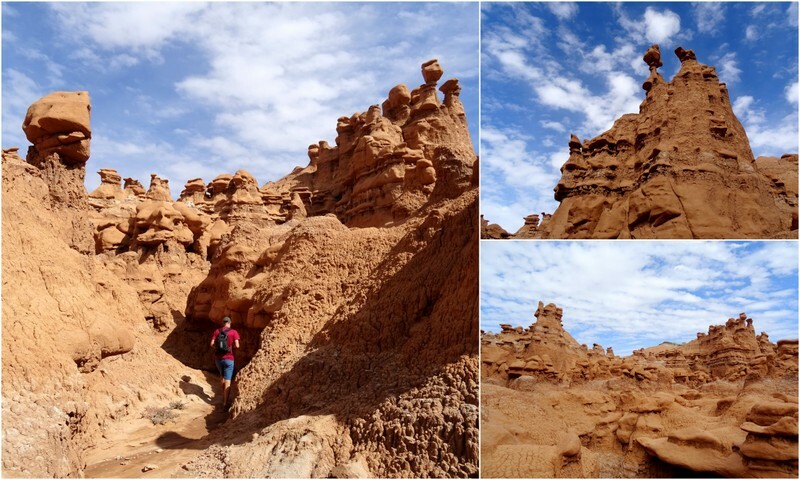 A few years ago while traveling from Capitol Reef to Moab we found ourselves passing through the southern section of the San Rafael Swell. 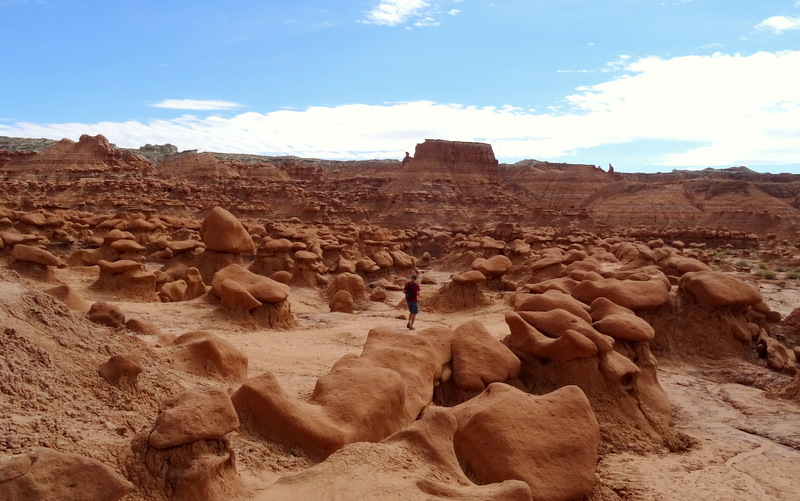 The intriguing landscape captured our curiosity and we vowed to one day return. Unfortunately, this area along Route 24 is a dead zone for cell service which limits us to a weekend visit. In an effort to have more time for exploring we headed out on Friday afternoon. 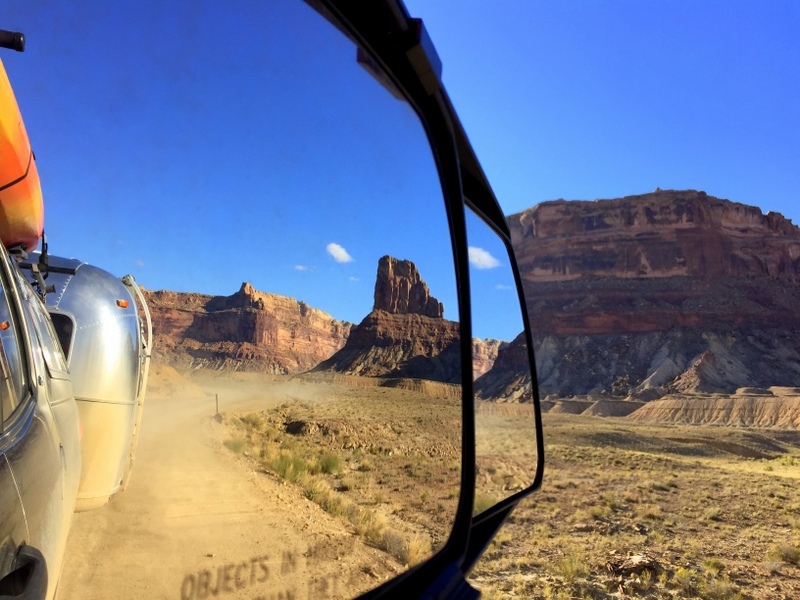 Our route options from the Little Grand Canyon were to travel 20 miles of dirt road to Castle Dale and then south to I-70, or drive 30 miles of dirt road through the Buckhorn Draw south to 70. 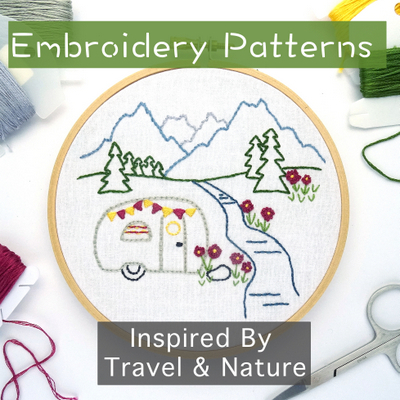 Google told us that the second option was quicker, and we already knew from yesterday’s adventure that the road was both scenic and RV worthy which made it an easy choice. Once again, this road was a delight to travel. Despite yesterday’s rain, it had dried out and the mud I feared we would encounter was gone. Plenty of dust though. 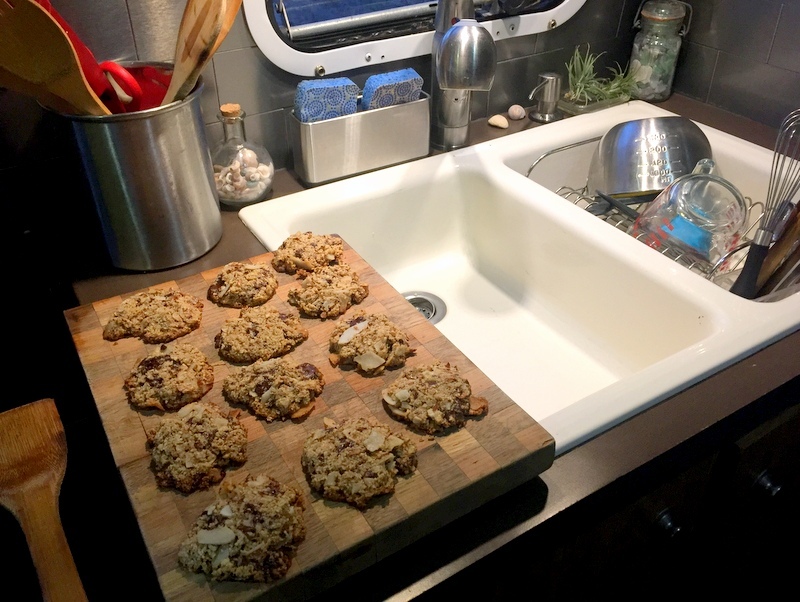 Good thing we gave up on keeping the outside of the Airstream clean a long time ago. 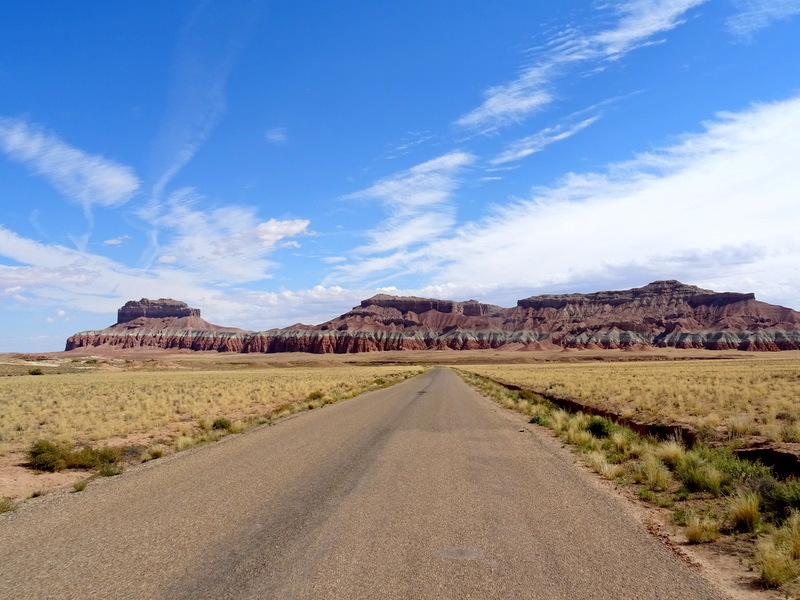 Even though this was supposed to be the shorter route, after stopping for several photo ops and filling up with gas in Green River, it was getting close to dark by the time we turned down the road to Goblin Valley State Park. The campground here is tiny with only 14 RV sites. We didn’t even bother to check and just assumed that there would be no open sites at 7 pm on a Friday night. 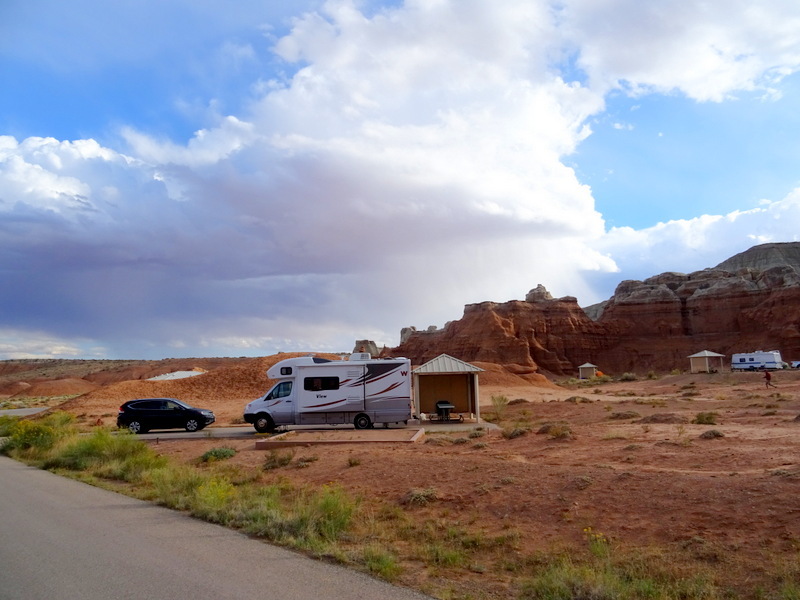 Lucky for us, the area surrounding the park is BLM land and offers plenty of boondocking options. In light of the fact that we were quickly losing daylight, we first tried the large parking area on Temple Mtn. Road. I believe this spot is used mainly as an ATV staging area. It was packed tight with RVs and the hum of generator noise was strong. We didn’t even get out of the truck before turning around. We can do better. I read on Campendium that there were a number of much better options down the road. But with the light fading fast, neither of us felt like scouting down unknown roads. Instead, we drove back to the intersection of Temple Mt. 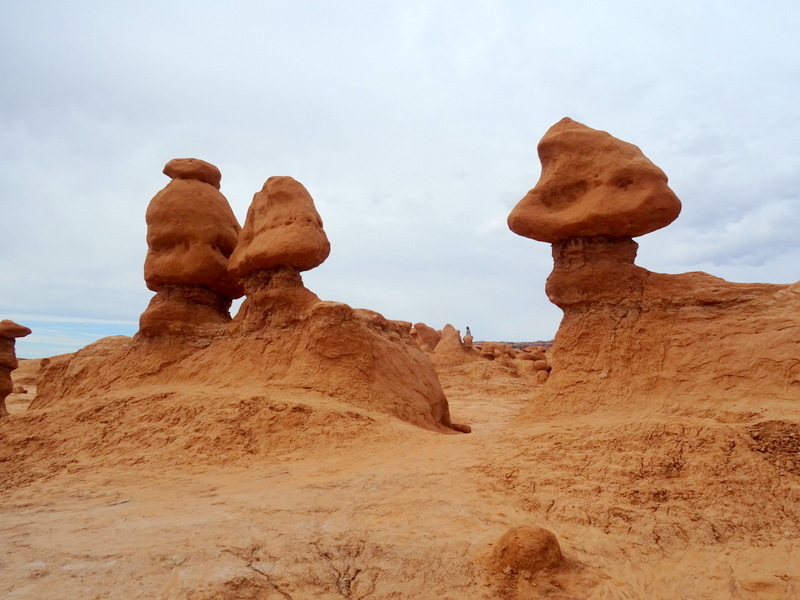 and Goblin Valley road and pulled down a random dirt road with a small turn around at the end. It was raining when we woke up. It was not supposed to rain this weekend. In fact, it wasn’t even supposed to be cloudy. With no cell signal to check the weather, we stayed in bed longer than normal hoping it would clear up. 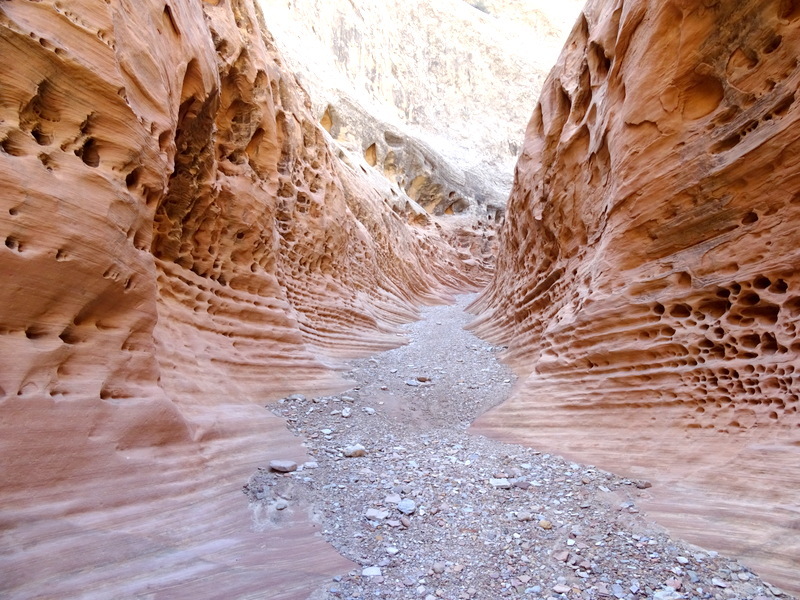 We had planned on hiking through two slot canyons today. I guess that’s not happening. 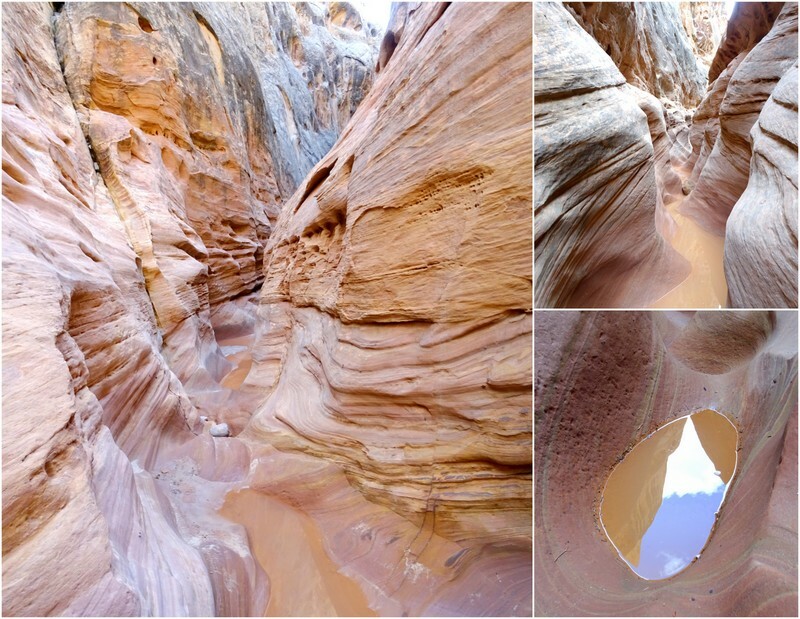 With the slot canyon idea out, we decided to flip our plans and visit the state park today and slot canyons tomorrow. The rain stopped sometime late in the morning and we drove down to the park. 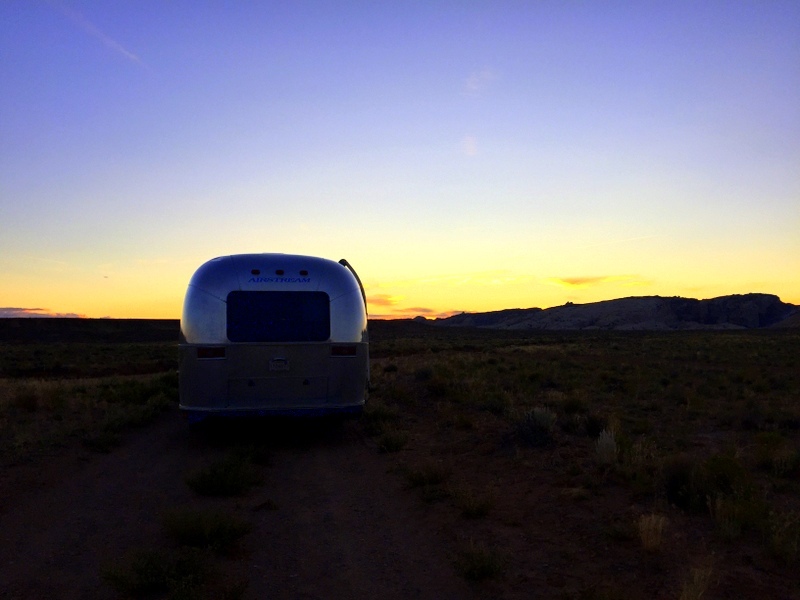 The Airstream got to come along so we could dump tanks and fill with fresh water. 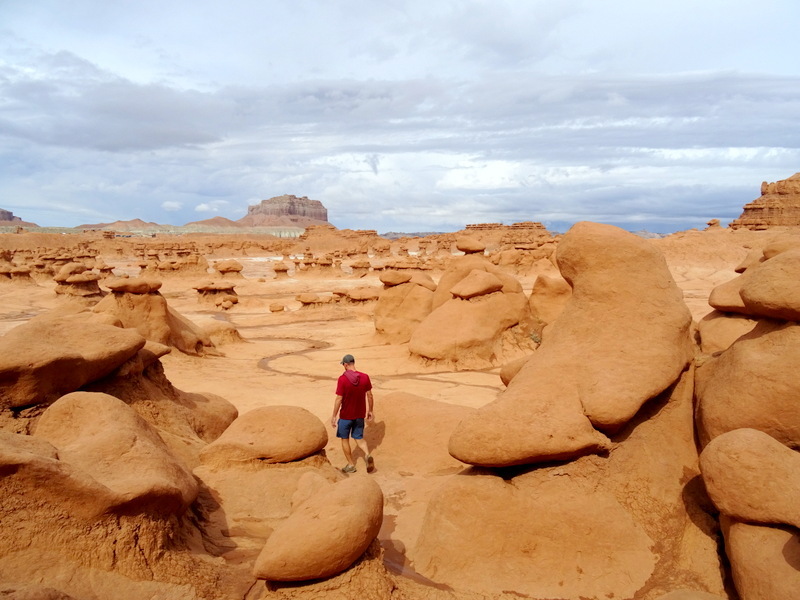 Goblin Valley charges a $13 day use fee and told us we were welcome to use the dump station for no extra fee. Yet another good experience with a Utah state park. Plenty of other parks would have charged both a day use and dump station fee (ahem..Colorado). After taking care of business we headed a few miles to the main viewing area and trailhead. Not a lot of RV parking here, but Tim was able to use his mad skills to parallel park the Airstream in between a tour bus and another RV. Since I’ve only recently mastered backing up the truck without the Airstream I am constantly impressed by how he can maneuver that thing. 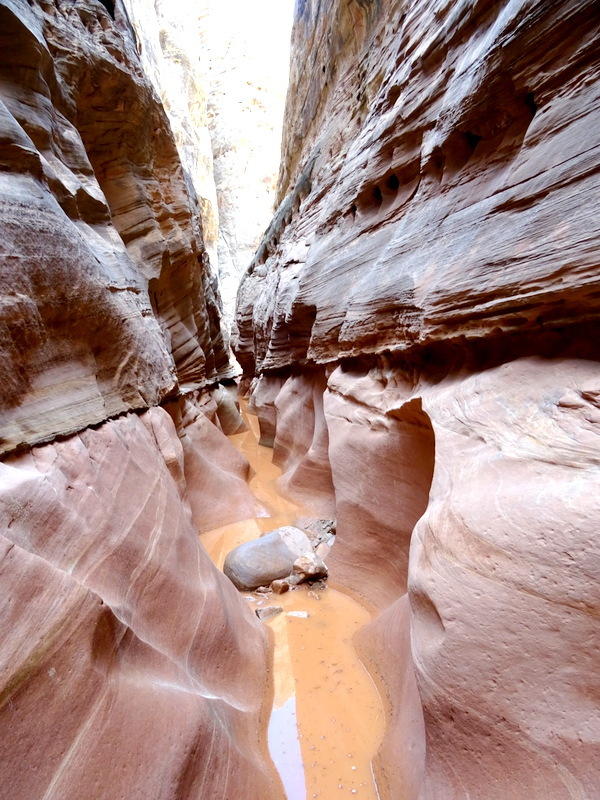 Valley of the Goblins has a few short trails that explore the area and a popular canyoneering spot called the Goblin’s Lair. We had planned to do at least two of the trails until we found out that the park allows you to simply walk around on your own. We always like the idea of exploring on our own so we set off into the playground of goblins to see what we could find. If it were up to me this park would be called the “Valley of Mushrooms”. 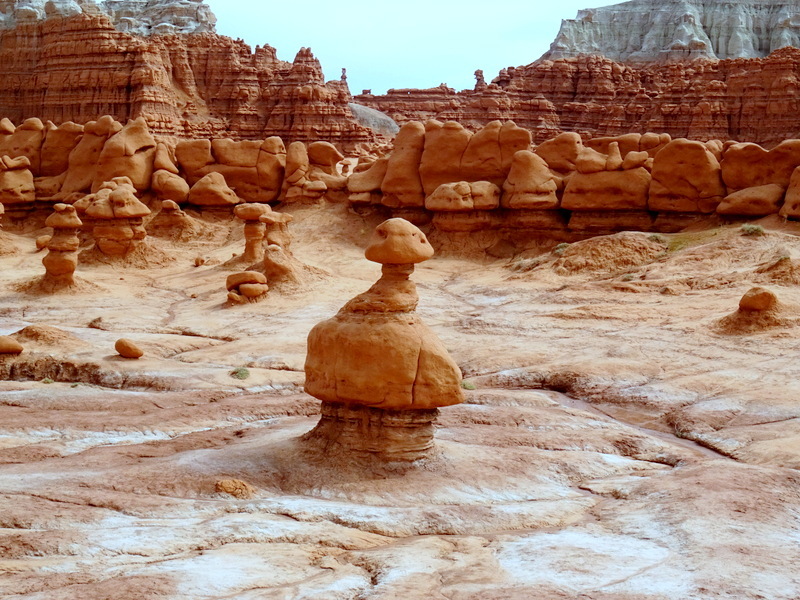 What weirdo saw these rocks and thought of goblins? I’m not even sure I know what a goblin looks like. Okay…I just did a Google image search. 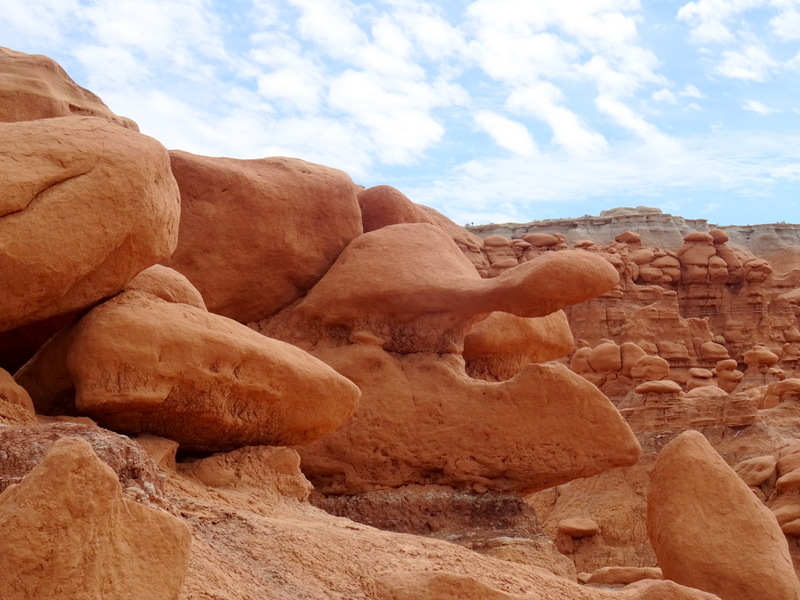 My guess it that because goblins have big heads and little bodies they slightly resemble the rocks found here. I still say it should be mushrooms. We had a blast climbing and hiking around the park. There are actually three valleys here and since most people never make it past the first one, it was really easy to get away from the crowds. 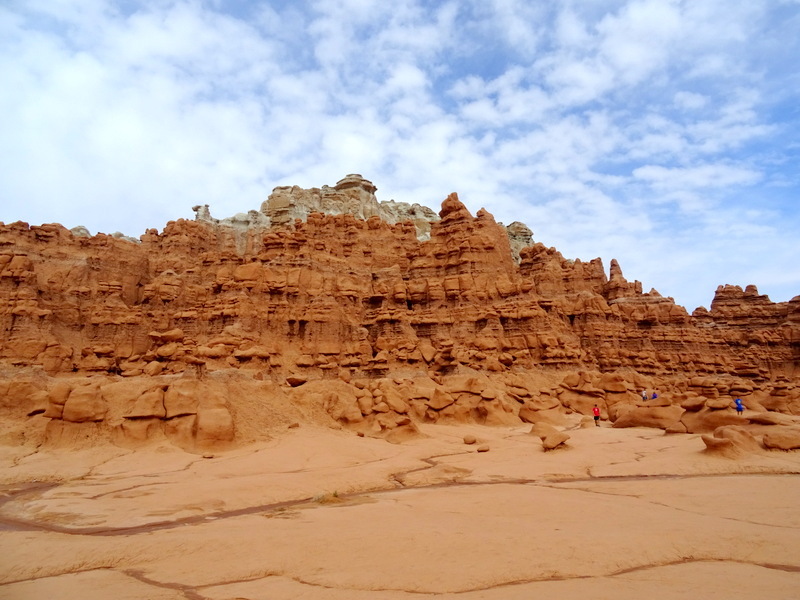 We wandered around admiring the rocks and making several failed attempts to go up and over the large rock formations on the edge of the first valley. Every time it seemed like we found a way through, a large boulder or rock fall forced us to turn around. 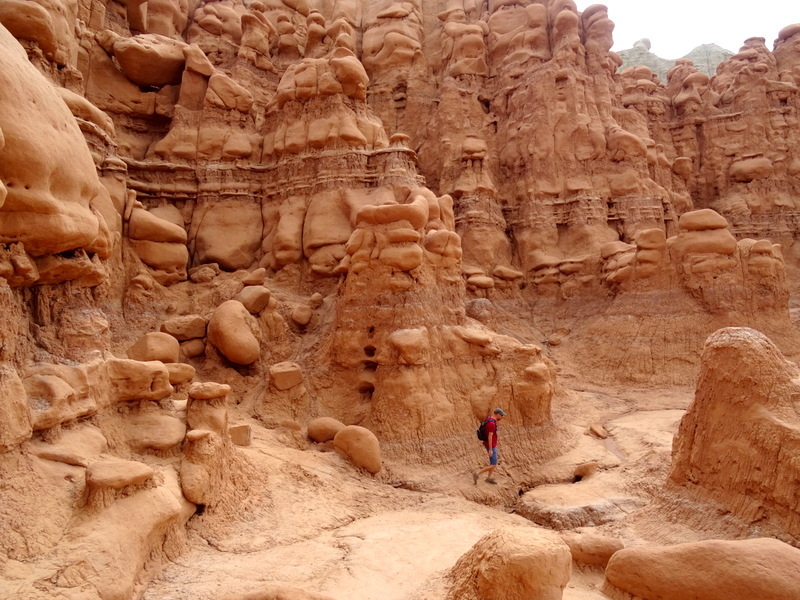 We both love rock scrambling, but with no ropes or actual canyoneering experience, we have limitations. 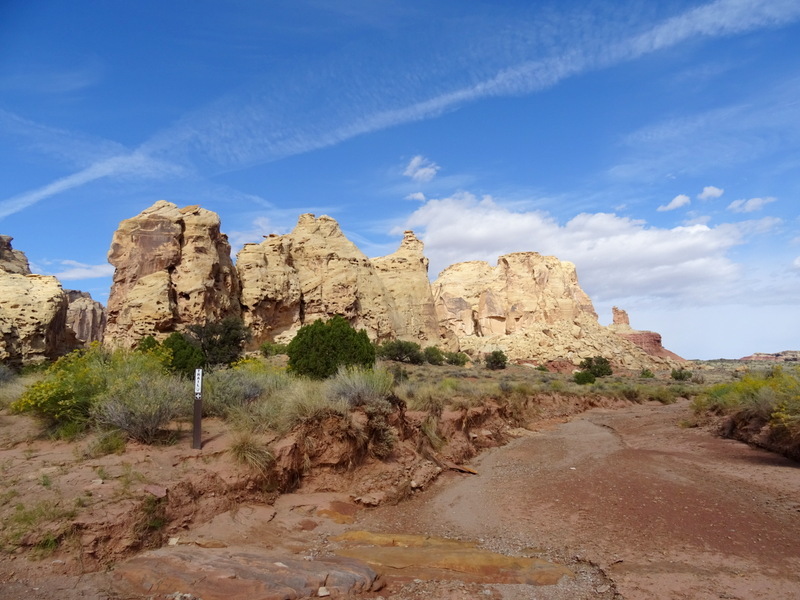 Eventually, we hiked far enough to the southwest that we made it to the second valley. At least I think we did. Once you get away from the main observation area there are no signs or markers in the valley so it was kind of hard to tell exactly where we were. 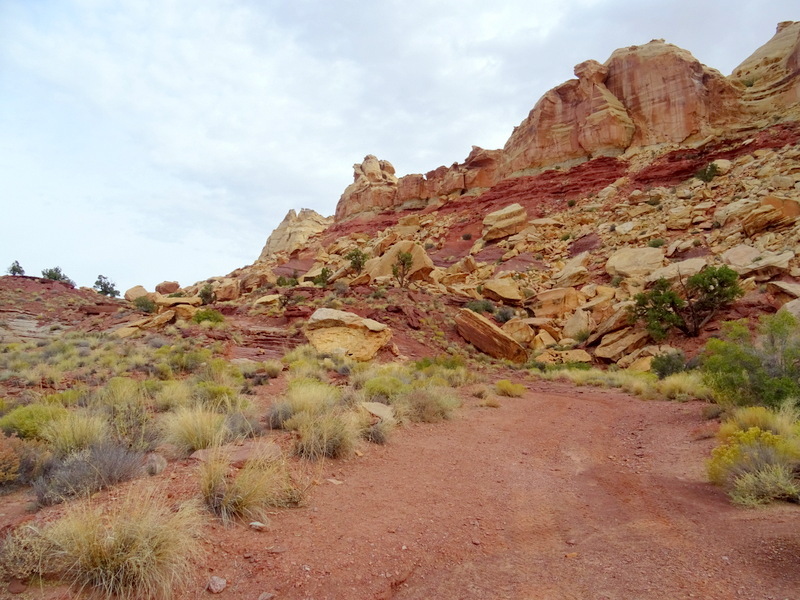 At some point, we stumbled into a curving wash that led us around a large flat-topped butte and past some really tall rock figures. 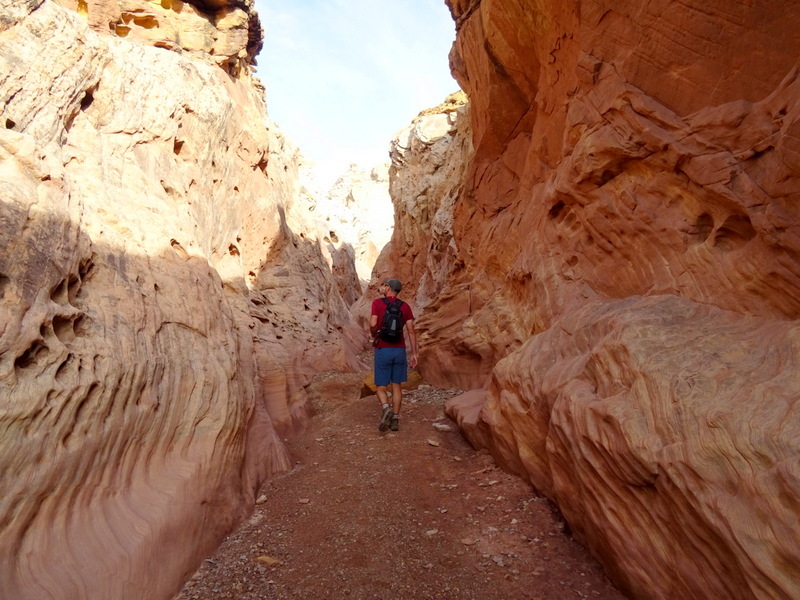 We followed the wash until it narrowed into a slot canyon. We never found out how far it went because I soon reached a ledge that I couldn’t get over even with Tim’s help. Back down the wash we went and then in a spur of the moment decision turned and climbed up a steep slope. It was a bit scary as the dirt was sliding down as we climbed up. I almost got stuck at one point on a particularly steep section. Tim was already at the top and going back down was the scarier option so I pushed the fear down and scrambled as fast as I could to the top. We walked around the top of the mesa for a bit taking in the views and eventually made our way to a high point. Looking south we could see below what must be the third valley. Wow! Okay, now we just have to get down off this mesa. Easier said than done. Just like when we were trying to climb up the rocks, going down presented us with the same problem of running into large boulders and drop-offs that we couldn’t navigate. I like to think of us as careful, yet adventurous, explorers. We enjoy getting off the beaten path and challenging our physical abilities, but we try to never take unnecessary risks. While we weren’t exactly in the middle of nowhere, we were pretty far out in the park and the chance of someone coming along to help if one of us got hurt was slim. So we slowly picked our way down, turning around several times to find a safer route and always making sure we had an escape route if the one we were on proved too dangerous. Once we made it down to the valley floor it was an easy walk back to the parking area. 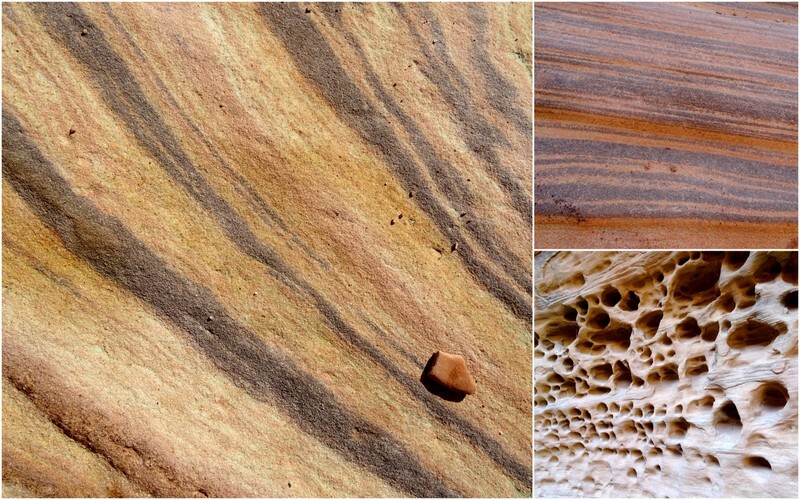 Our exploration had left us dirt-smeared, sweaty and covered with scratches from the rough sandstone rocks. Well…I was covered with scratches. Tim somehow managed to escape injury free. I seem to go through these phases where I’m always getting cut and scratched — mostly on my legs. As a result, from the knee down my legs often look like they did when I was eight. Taking advantage of our full water tank we washed the grime away with long parking lot showers before hitting up the dump station on the way out to once again empty the grey tank and top off the fresh water. I would say that we definitely got our $13 worth from this park. Now to find a place to park for the night. When we drove in on Friday Tim spotted an RV up on a hill near the main intersection. If there was anywhere we might get a bit of cell signal it was up there. It’s not that we can’t survive a weekend without Internet (well, I can – Tim might argue that point), but if we could get a signal that meant we could stay into the work week. Maybe we can find a signal up here on this hill? It turned out to be a great place to park for the night with an amazing 360-degree view, but not enough signal to stay. Even with all antennas deployed and the booster on we were only able to get an intermittent signal. And by intermittent, I mean that it worked for about 10 minutes and then didn’t work for the next 4 hours. It did come back for a bit after that but then was gone again in the morning. Not stable enough for the work week. An early night last night had us up and ready to go bright and early. With only a few hazy clouds around and the sun peeking through it seemed like the perfect day to visit the slot canyons. 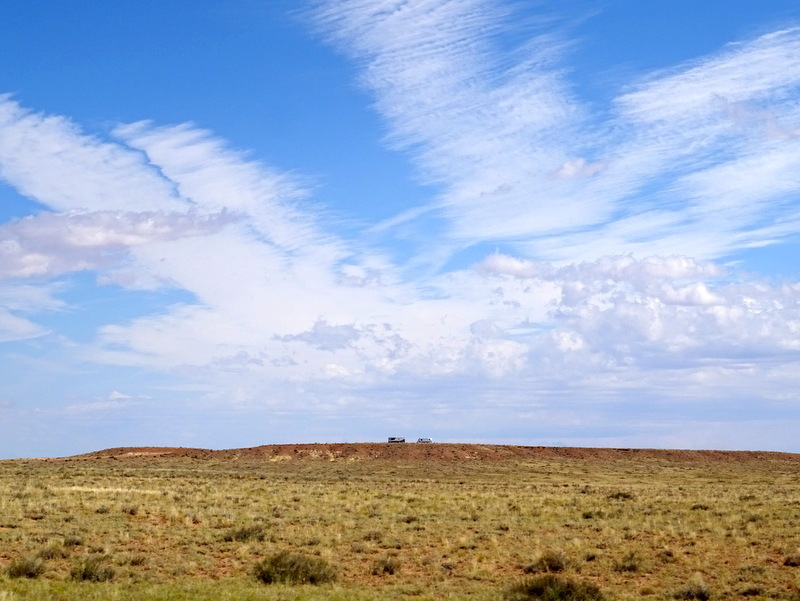 The two popular ones in the area are Bell and Little Wild Horse Canyon. 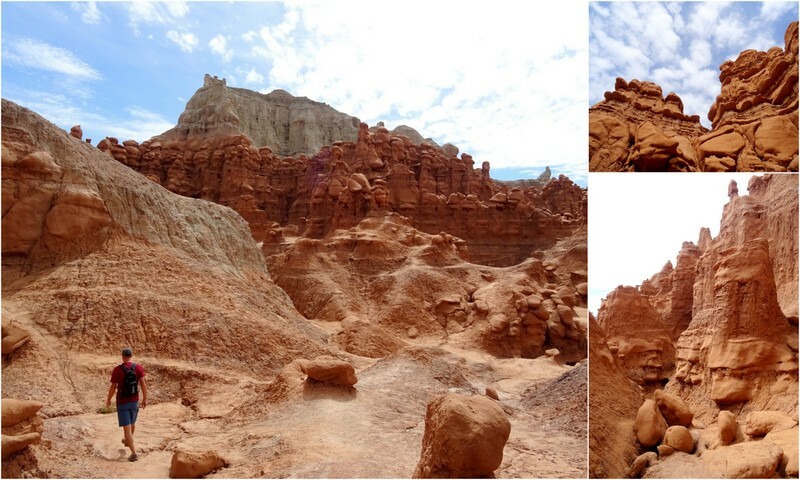 Most people simply hike part way up Little Wild Horse and then turn around. But we’re not most people. 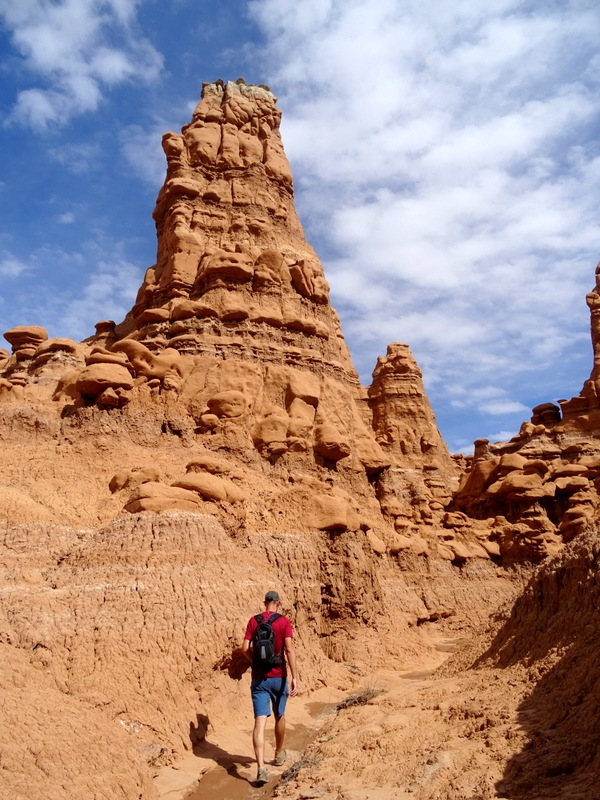 We chose option B which involves hiking both canyons in an 8.5-mile clockwise loop that goes up Bell and down Little Wild Horse. 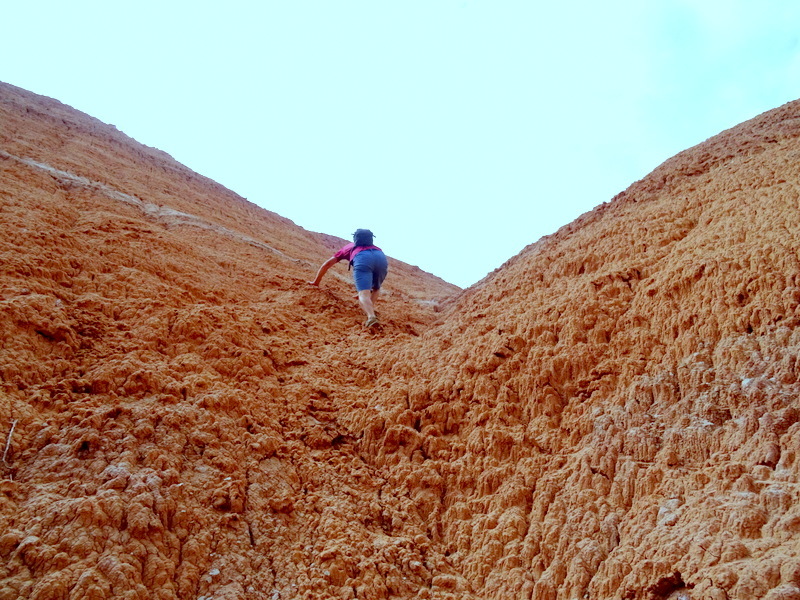 All accounts that we read of the route said it required only minimal rock scrambling. We also read that sometimes after rainstorms Little Wild Horse had a bit of standing water. No big deal, we’re not afraid to get our feet wet. 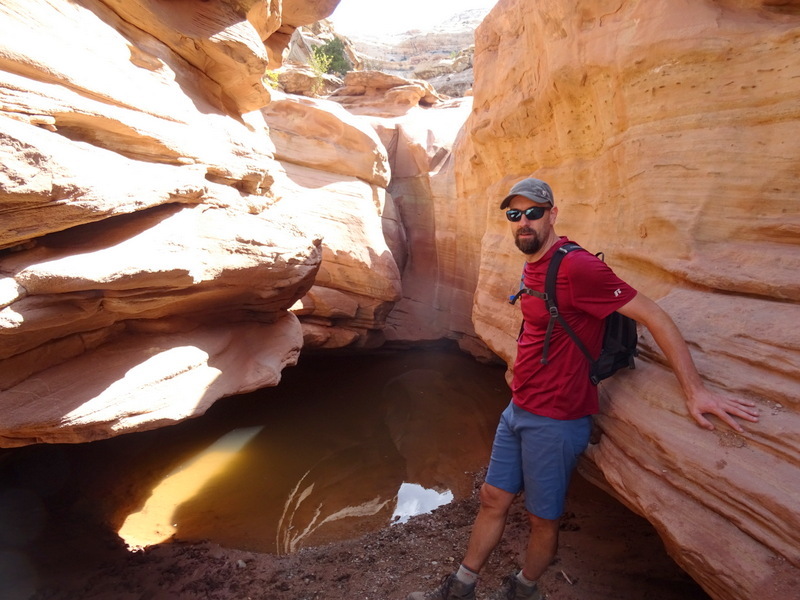 Except when we arrived, the entrance to the first canyon was full of very deep looking water. There was a well-trodden trail up to the left so we assumed (hoped) that this must be a common occurrence and not a sign of what was to come. After making it past the first obstacle we came to a split in the trail indicating Bell Canyon to the left and Little Wild Horse to the right. Overall, Bell is considered to be the less spectacular of the two. I would agree with that assessment. 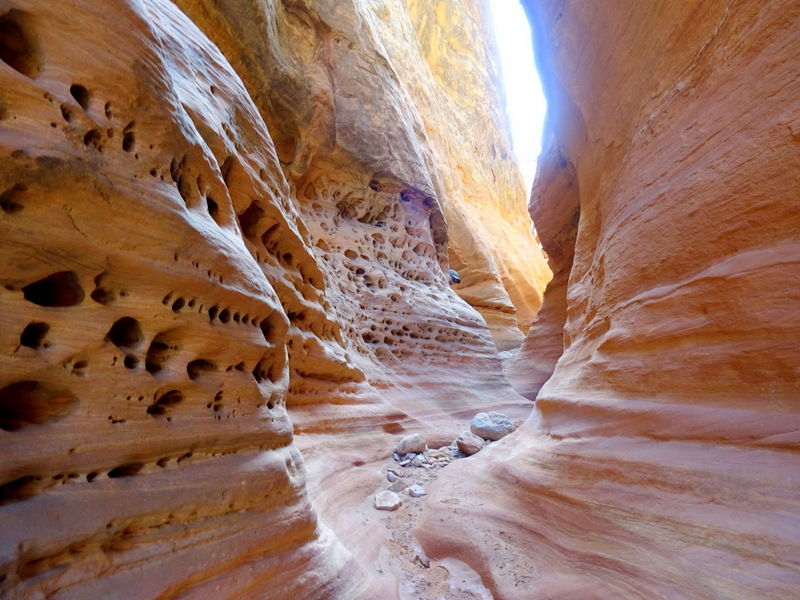 While it did have some short sections of narrows, the canyon walls were never more than 15-20 feet high and it lacked the wow factor of some other slot canyons we have visited. I know it looks cool, but wait until you see the next canyon! There were several rock falls that we had to navigate over. Some had rocks stacked at the bottom to make climbing easier and some had alternate routes up and around. There was only one that I needed Tim to give me a little boost up and over. 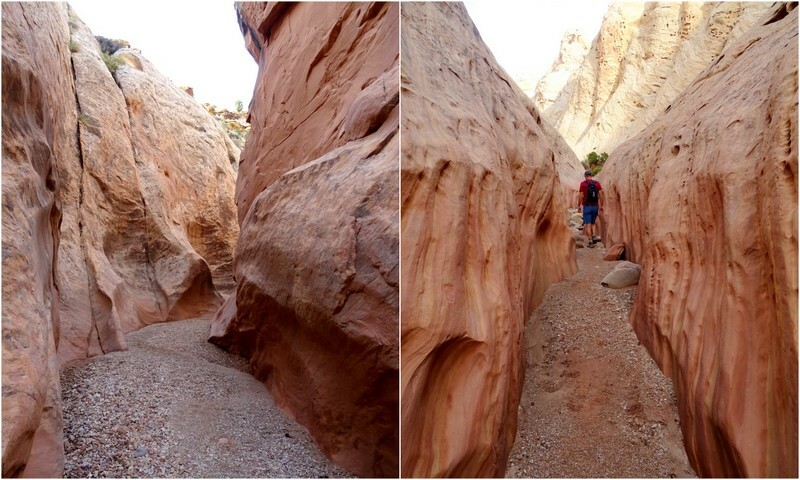 Eventually, the canyon widened and we walked through a wide wash for awhile before reaching the Behind the Reef Road. 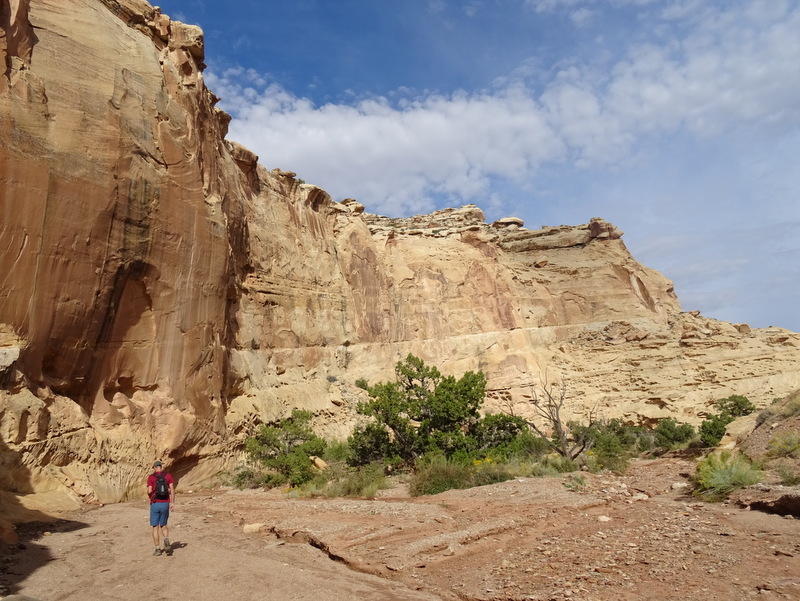 We were now officially on the other side of the San Rafael Swell. The map shows a large network of 4×4 roads back there that looked like a lot of fun to explore. If we had been able to stay longer I would have loved to bike on some of these roads. 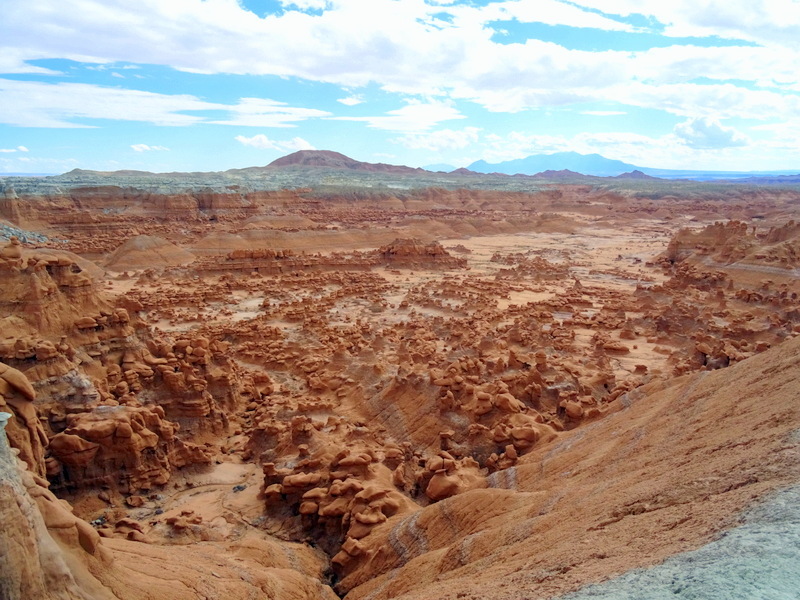 An easy 2-mile uphill trek on the dirt road brought us to the junction for Little Wild Horse Canyon. 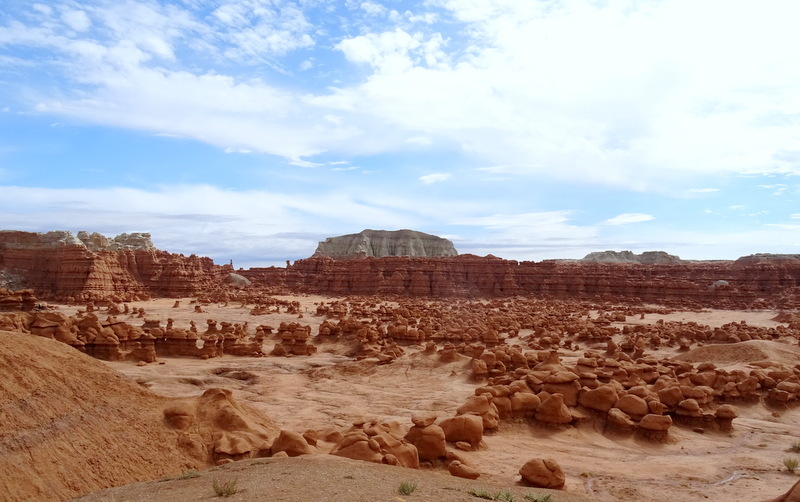 At this point, the sky had cleared and with no sign of rain, we felt confident about going into the slots. 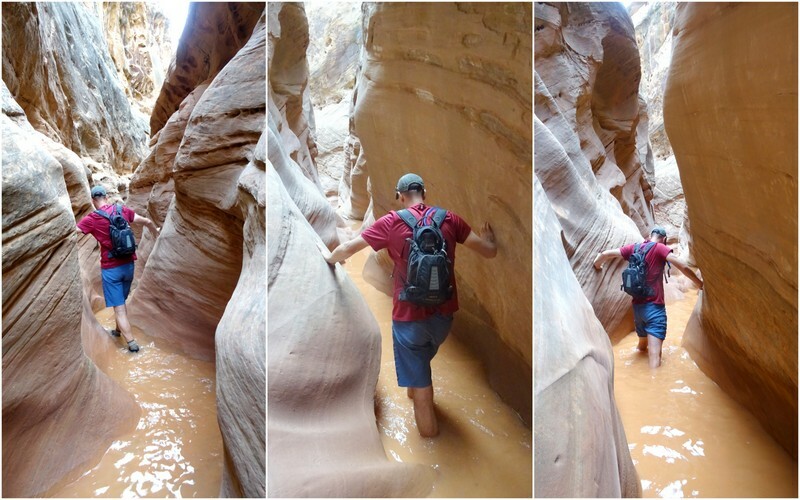 Walking through a little water is no big deal, but getting caught in a rainstorm inside a narrow rock canyon could be very disastrous and not a risk we would take. The weather might have been perfect, but we almost had to turn around before the fun even started. 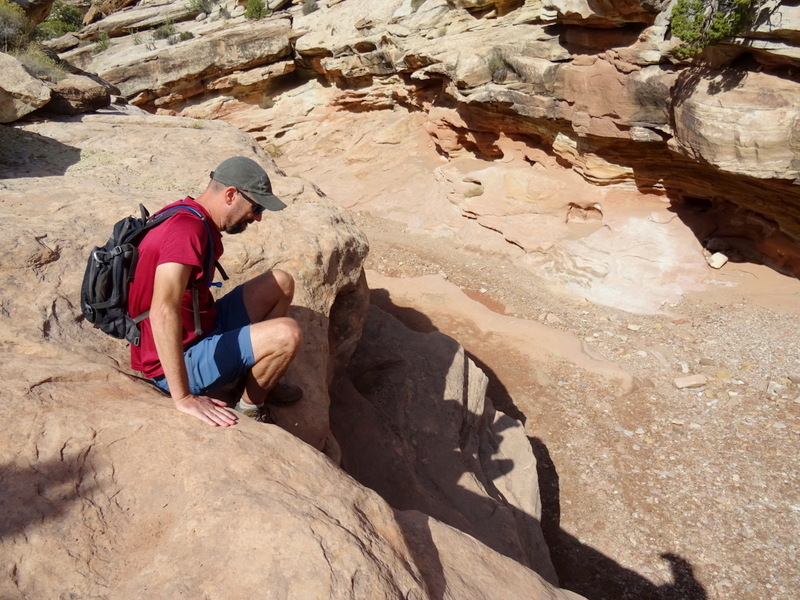 There was a large 10-15 foot drop to get into the canyon. 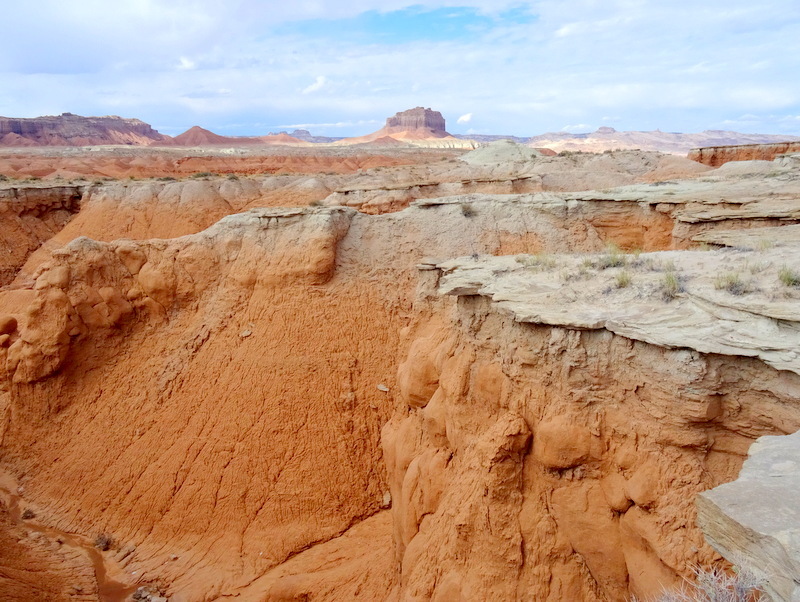 With no obvious way around, we scrambled along the rim looking for a safe way to drop down in. It seemed hopeless until Tim went back and saw a faint trail down the rock on the left of the steep drop. Don’t know how we missed that the first time around. 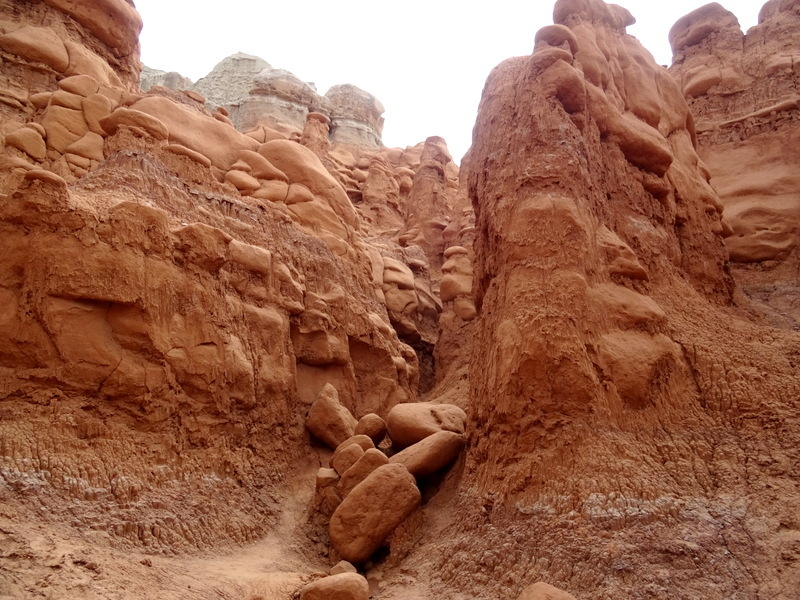 After a few more obstacles down and around large rocks, and the canyon began to curve its way through increasingly narrow rocks. This is what we came to see! 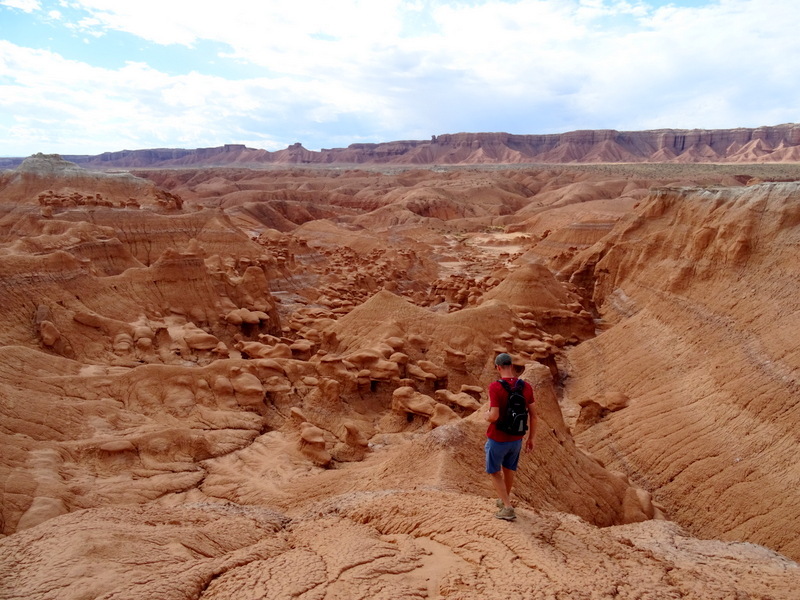 I was so entranced by the beauty of the canyon that I forgot all about the potential water. And then we saw it. At first, it was just a few puddles, but then we came upon our first deep area. A thrown rock showed that it was probably about 6-inches deep. Tim went first and demonstrated how his long legs could be used to avoid getting wet. There was no way I was going to manage that without falling on my face. I had no choice but to get my feet wet. It was only about ankle deep but so very cold! After that, we began to encounter more and more water. Some was easy to avoid, while other areas required walking through. Even Tim gave up on his parkour moves and got wet eventually. 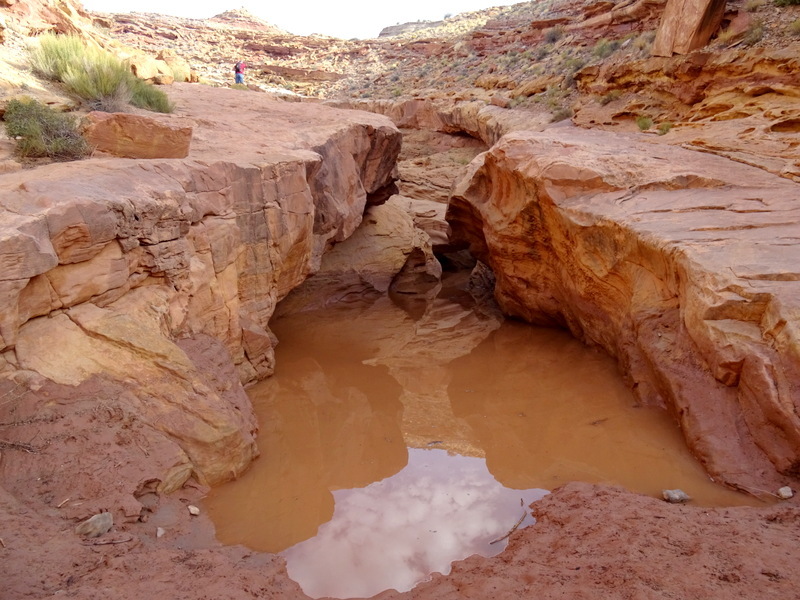 We hadn’t thought to bring a stick into the canyon with us, but throwing rocks in the puddles helped gauge the depth. It was after this last section that we came upon our first group of hikers. They looked wet — really, really wet. I said “I guess we’re going to get wet” and she pointed to an area just below her bust line to show me where the water came up to. My jaw dropped. At this point, we were 7.5 miles into the 8.5-mile hike and had come down a few obstacles that I would have been really hard for me to climb back up. I guess there’s no turning back now. With our backpacks on our heads, we slowly waded into the water. Tim went first and then took a bunch of embarrassing pictures of me crossing. It was soooo cold! Well that was an adventure! We started running into more hikers after that and tried to warn people about the deep section. No one that we encountered looked like they were prepared to get wet. I suspect most people only went as far as the deep part and then turned around. 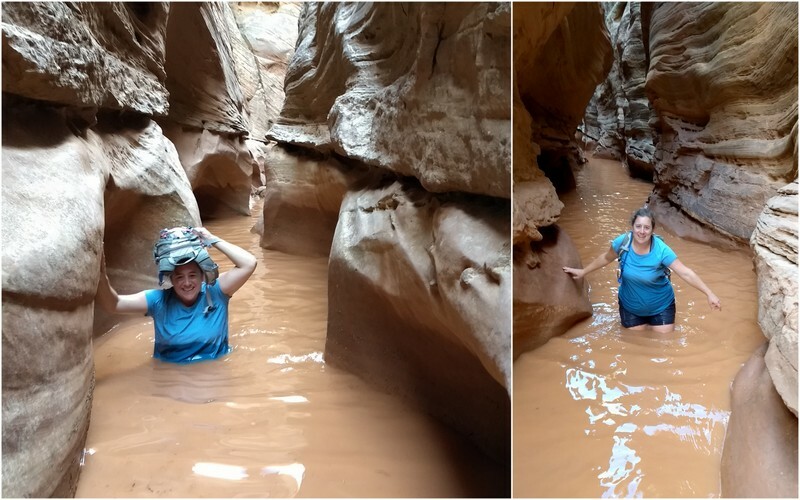 Despite the water obstacles, I’m really glad we hiked the entire loop and would highly recommend it to anyone wanting more of a hike than most slot canyon experiences offer. 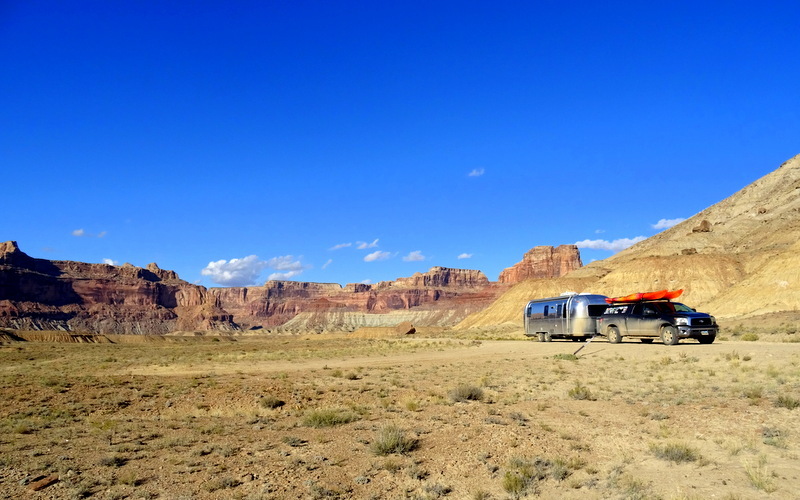 A short ride back to the Airstream for a quick change of clothes and then we packed up to headed down the road to Capitol Reef. Thanks so much for the nice comment. Splitting up the writing into daily incraments in much more enjoyable for me and I’m happy to hear that so many others enjoy it as well. Wow! Great post, great pictures, great adventure. I’m not sure I would have waded through that water. I keep thinking, what if there were leeches, or I met a water snake coming down the canyon . BTW, I like your new format. Ha! Trust me, I was very much thinking about any creepy crawlies that might be in the water. 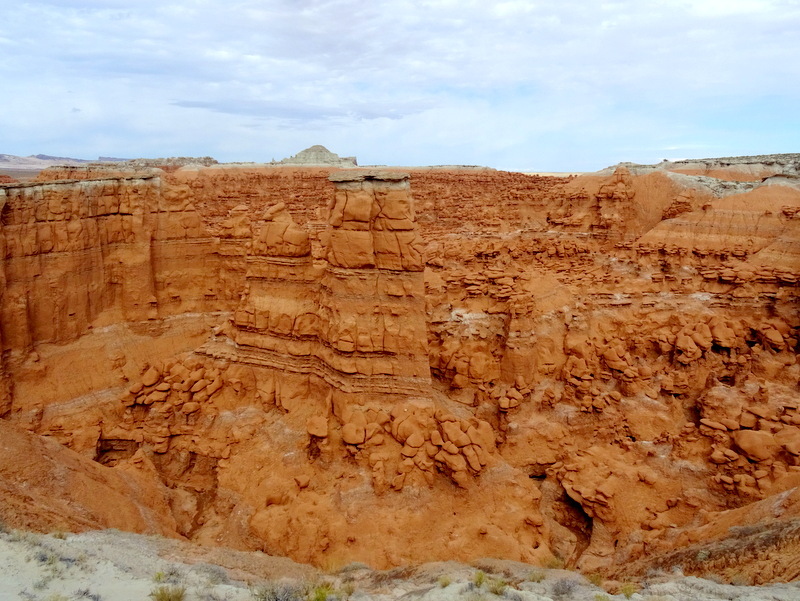 But I also knew that since the canyon is usually dry and when it rains the water flows very fast, the chances of anything living it there were very slim. It was still a worry though! What an amazing adventure! I had to look up parkour…thanks for the new word! I can imagine your trepidation, knowing you’re not about to turn around when you’re that far into the hike!!!! I had to look up how to spell parkour! Not a word I’ve ever typed before. It was with a mix of fear and determination that I entered that water. Thankfully it was warm out and we didn’t have far to go. Otherwise, the rest of the hike could have been miserable. Great pictures of the Goblins! 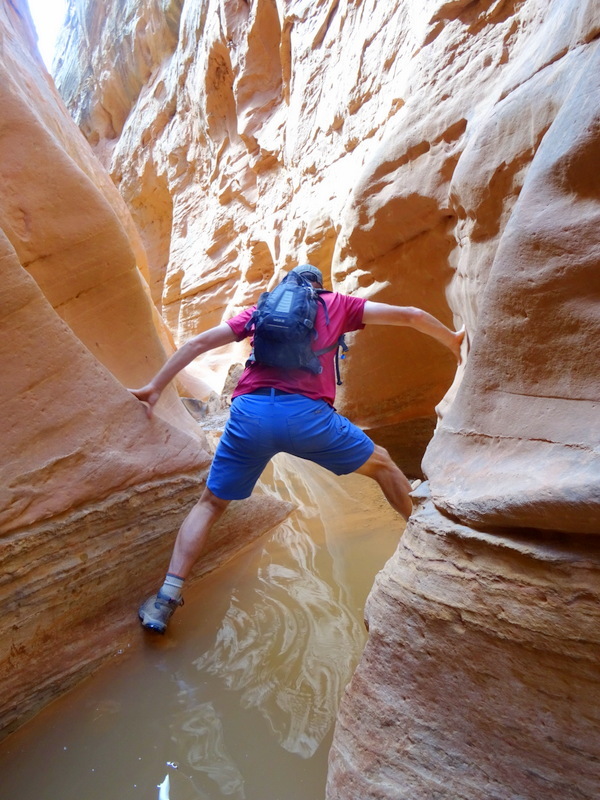 Kudoos for going forward in the flooded slot canyon. Sometimes you just have to go for it! Well, that was certainly different than when we did that hike! I know I would not have wanted to turn back after going that far but doubt that Jim would have trudged through water that deep. It was bone dry when we were there but we didn’t know it was UEA weekend and as we entered Little Wild Horse we must have encountered a hundred people and kids, some of whom did parkour moves above our head to pass. Crazy! By the way, UEA weekend is coming up Oct 19-23. Be sure you are settled in before Thursday as families come out in droves to camp and hike that weekend. Of all the accounts I read of the hike, not one person mentioned water this deep. We must have gotten lucky :) Sounds like an interesting scene in the canyon when you visited. We were very happy to encounter only a handful of other hikers. And thanks for the heads up on the UEA weekend. I just made a reservation for an RV park in Bryce during that time so we should be good. But I won’t be surprised if the trails are super busy. Tim is always ahead and walking away except for one picture…..
Hmmm…now I’m going to have to keep the trend going in upcoming blog posts.